June – Don’t Fear the Dark! This weekly series has presented some of the best of the ACC members work for the past 3 years or so. Some have concentrated on composition, some on light, portraiture, sunsets, sunrises, the mountains, the coast – the list could go on and on. The above is simply a spontaneous image, captured on a recent visit to one of George’s favorite spots on earth, Grayson Highlands State Park. The lady being pursued (maybe a treat has already been passed on?) is his daughter Rebekah on a brief visit to NC from her home in Jerusalem. There’s certainly nothing planned or posed and yet the backlighting is perfect and the background couldn’t be more appealing. 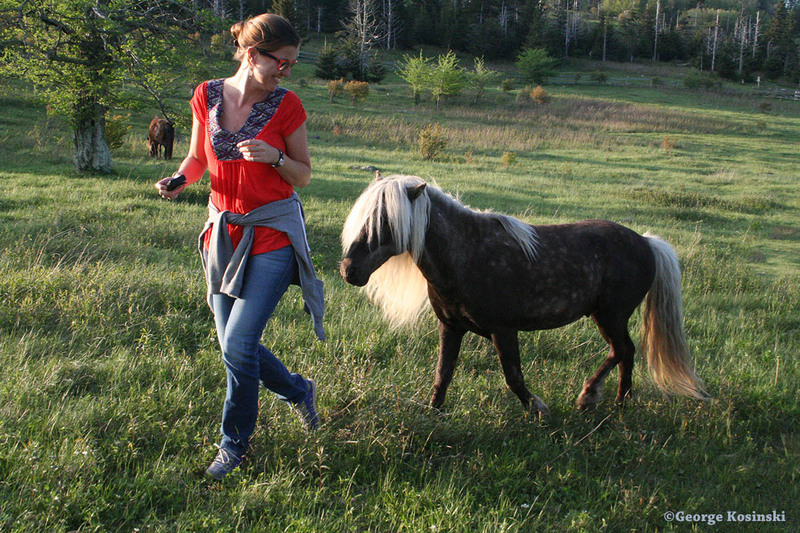 “The ponies can actually be a bit imposing when they begin to close in,” says Rebekah. Being prepared and selecting the peak moment can sometimes be the key to a memorable shot. This entry was posted in Animal, Mountains, State Park and tagged Canon, George Kosinski on May 31, 2013 by GAR. George Rembert, you are a rascal! I like it George. Great Photo. Take some more.